Once having a population of nearly 10,000 people, Skagway, Alaska grew to prominence during the Klondike Gold Rush of 1897. 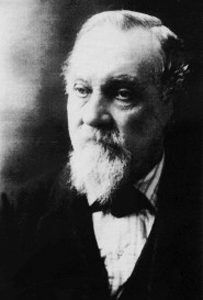 A few years before the gold rush, William “Billy” Moore, a former steamboat captain, had gone north from British Columbia, Canada. Working for a surveyor, he discovered the White Pass route through the Coast Range and decided a town should be built at the salt-water end of the route, where the Skagway River spilled into Lynn Canal. In August 1896, gold was discovered in the Klondike region, and the first boatload of prospectors landed at Skagway in the summer of 1897. Though he had planned for them to come, Captain Moore and his son, Ben, were pushed aside and ignored by the stampeders. In fact, the newcomers took over the Moore homestead and the surrounding area and laid out a townsite without consulting him. Worse yet, they forced William Moore to move his cabin since it encumbered a newly plotted street. William Moore had been ignored and humiliated, but he did not give up. Instead, he got busy and extended his wharf to better serve arriving ships. 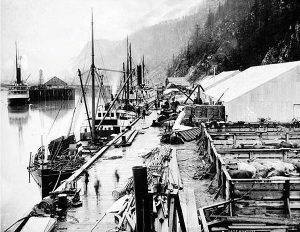 The wharf made money and aided the growth of the town, even though most of the traffic continued to move towards the nearby town of Dyea and the Chilkoot Pass. While Skagway was a place of transit for most people, merchants like Captain James Carroll established enterprises and government officers, like C.L. Andrews, the customs collector, were residents. All that autumn of 1897 and into the winter, steamers continued disgorging gold-seekers, cattle, horses, tools, food, and villains into Skagway. The town quickly grew to a peak of some 10,000 as stampeders tried to get their required year’s worth of gear and supplies over the Coast Range and down the Yukon River headwaters at Lakes Lindeman and Bennett. One of the many new-arrivals was Jefferson Randolph “Soapy” Smith, a gambler, con-artist, and bully from Colorado who boasted he would be the boss of Skagway. By corrupting a U.S. Deputy Marshal, Skagway’s only law enforcer, and posing as civic-minded citizens, Smith and his cohorts took over the fledgling town. 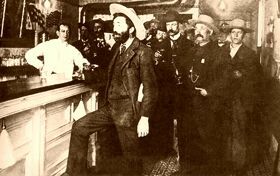 He soon established a saloon-gambling den called Jeff Smith’s Parlor and placed men along the trail to steer the unwary into his place. He controlled the businesses and legal system while trying to pass himself off as being kind to animals, kids, and widows. Soapy Smith in Skagway, Alaska, 1898. 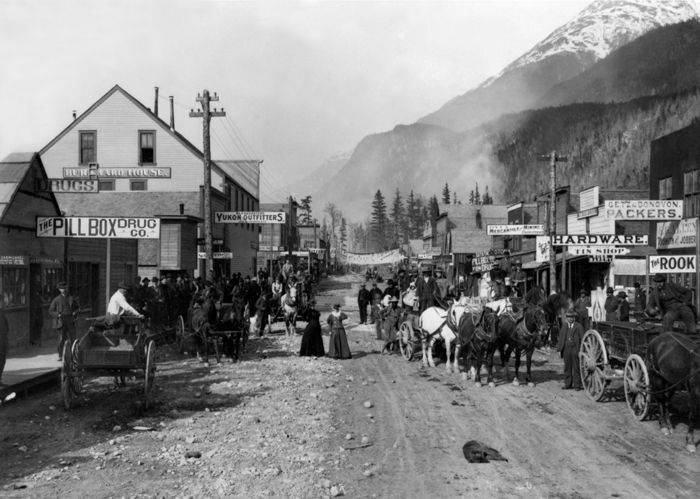 Between 1897 and 1898, Skagway was a lawless town, described by one member of the North-West Mounted Police as “little better than a hell on earth.” Fights, prostitutes and liquor were ever-present on Skagway’s streets, and con man “Soapy” Smith, who had risen to considerable power, did little to stop it. Before the gold rush, the Chilkat branch of the Tlingit Indians controlled Chilkoot Pass and monopolized all trade between white traders and Indians of the interior. They also held exclusive rights as packers for prospectors headed over the pass. Matters quickly came to a showdown between the Indians and whites after the stampede began, and the United States Navy was called to keep the peace. Soon the monopoly was broken and the Indians were ignored. Two trails were used by the gold seekers to reach the headwaters of the Yukon River. The 33-mile-long Chilkoot Trail began at nearby Dyea. and the 40-mile White Pass Trail began at Skagway. 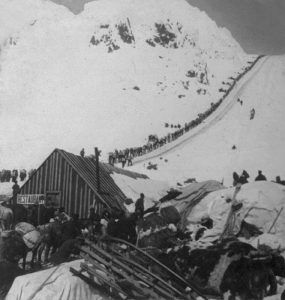 Thousands of men carried supplies up the Chilkoot Trail, which was too steep for horses, or took the 40-mile White Pass trail to Lake Bennett, where they built boats to float down the Yukon River to Dawson City and the gold fields, 500 miles distant. Chilkoot Pass received most of the publicity and became the most popular of the trails because White Pass was too swampy. In the meantime, the communities of Skagway and nearby Dyea, located about nine miles to the west, developed from temporary tent cities to towns with many buildings. Each town boasted of its commercial and civic amenities, churches, schools, a newspaper, and government. For the next several years, the two towns would vie for dominance. By October 1897, a Northwest Mounted Police Report described Skagway as having “grown from a concourse of tents to a fair-sized town with well-laid-out streets and numerous frame buildings, stores, saloons, gambling houses, dance houses and a population of about 20,000.” In February 1898 Customs Office records showed that another 5,000 stampeders had landed just in that one month alone. Some of the prospectors realized how difficult the trek ahead would be to the gold fields, and chose to stay behind to supply goods and services to miners. 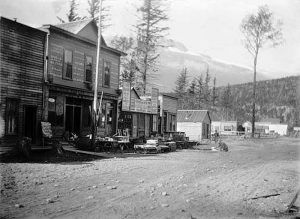 Within weeks, stores, saloons, and offices lined the muddy streets of Skagway. The population was estimated at 8,000 residents during the spring of 1898 with approximately 1,000 prospective miners passing through town each week. By June 1898, with a population between 8,000 and 10,000, Skagway was the largest city in Alaska. 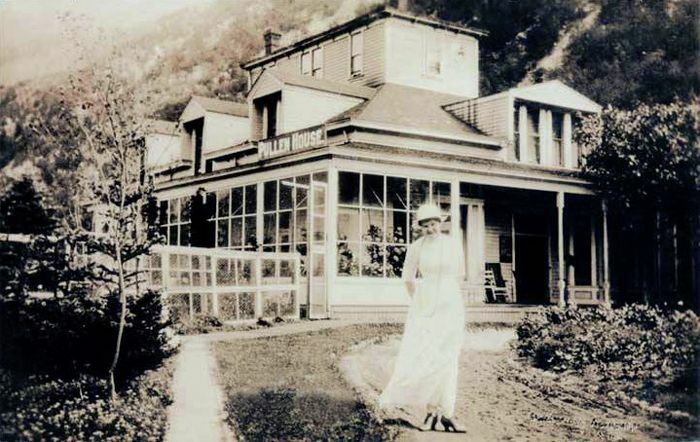 People came and people left, but some, like Harriet Pullen, put down roots in Skagway. She had been trying to wring a living from a marginal Washington state farm for herself and her four children when the Klondike was struck. In 1897 she joined the Gold Rush, arriving at Skagway with only $7. Soon her apple pies, baked in a tent, were delighting the men building Billy Moore’s wharf, and she was able to move to a log cabin. For a time she operated a pack train over White Pass with horses brought up from her Washington farm. Later, she settled down to become Skagway’s most famous hostess. She then bought a large house from William Moore and made the Pullen House the best hotel in town. In 1898, a 14-mile, a steam-operated aerial tramway was constructed up the Skagway side of the White Pass, easing the burden of those able to pay. Tramways also began to operate on the steepest section of the Chilkoot Trail the same year. In May 1898 the White Pass and Yukon Route railroad began laying narrow gauge railroad tracks in Skagway and a railroad depot was constructed between September and December 1898. 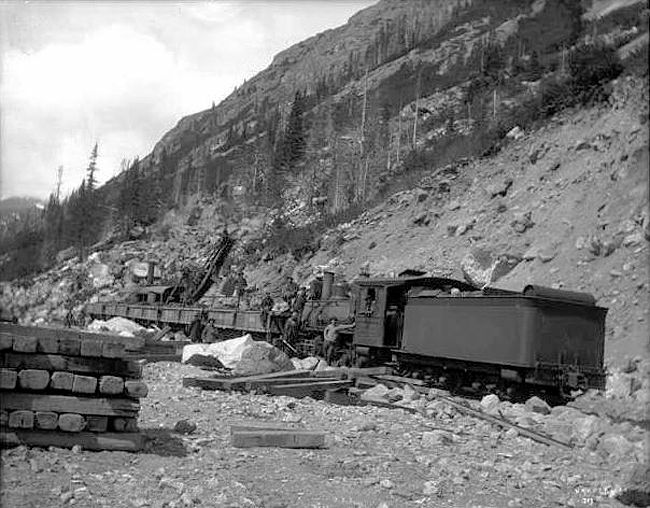 The White Pass & Yukon Route railway paralleled the White Pass Trail. It was completed in 1900. This destroyed the viability of nearby Dyea, as Skagway had both the deep-water port and the railroad and with the gold rush having declined only one town was needed to service traffic to the interior. In 1899, construction on McCabe College began and was completed in 1900. It was the first school in Alaska to offer a college preparatory high school curriculum.